- Migration trends by nationality. Continuing with analysis of population data from CSO released earlier this week, let's take a look at the age composition of population. 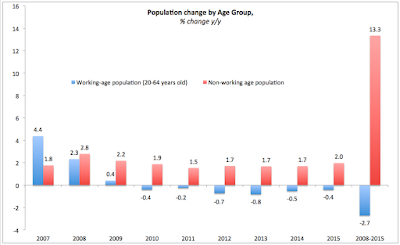 Working age group - population aged 20 years through 64 years. This is an approximate definition, and I prefer it to including 15-20 year olds into it, primarily because it allows for more accurate reflection of numbers in full time education. There are many caveats applicable here, so take the approximation for what it is - indicative, rather than definitive. Non-working age population (rest of population). Again, that is not to say that younger students do not work (at least part-time) or that people beyond 65 years of age do not work. Some do. Majority do not. When many do work, they work less hours than is required to sustain independent living, so they still rely on either pensions or social transfers or family transfers or any permutations of the three to sustain themselves. In simple terms, mindful of all caveats, etc, a ratio of working age population to non-working age population tells so a bit about how high is the dependency weight in the society due to age distribution in population. Lower ratio means fewer working age adults having to sustain themselves and non-working age people. By sustain I mean economically sustain - by working and adding value in the economy. What stands out in the chart? 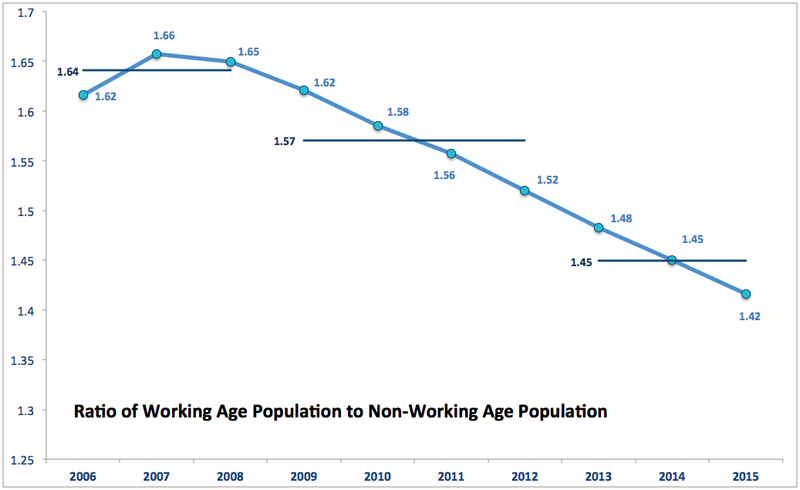 Working age population overall has been in decline since 2010. In cumulative terms, number of working age adults has fallen 2.7% on 2008 level by April 2015 - a decline of 75,500. In 2015, the rate of decline was 0.4% - more moderate than in three previous years, but still steeper than 2010-2011 average. 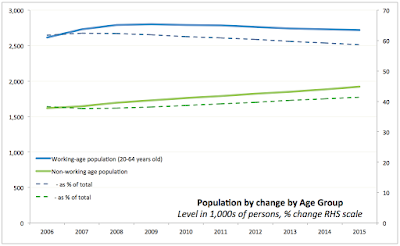 Non-working age population remains on the rise for every year covered by the CSO series and the rate of increase in 2015 (at 2%) was the highest since 2010. 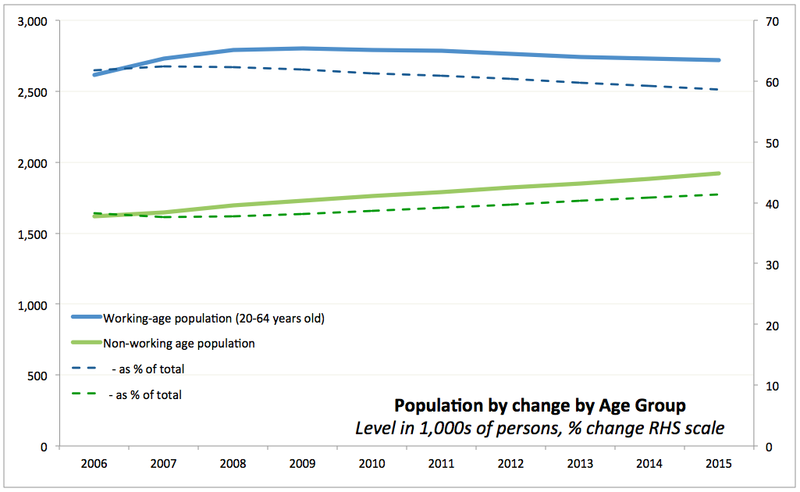 Overall, over 2008-2015 period, non-working age population those 13.3% or 225,900. 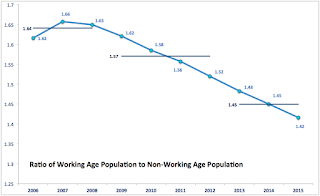 The gap between working age population and non-working age population is now at 798,400 - the worst reading in series history and 301,400 worse than in 2008. In 2015, the ratio of working age population to non-working age population was 1.42 - meaning that for each non-working age person, there were 1.42 working age adults. This does not correct for the working age adults who are not in the labour force as well as for the unemployed. The best performance year in this metric was 2007 when the ratio was 1.66. 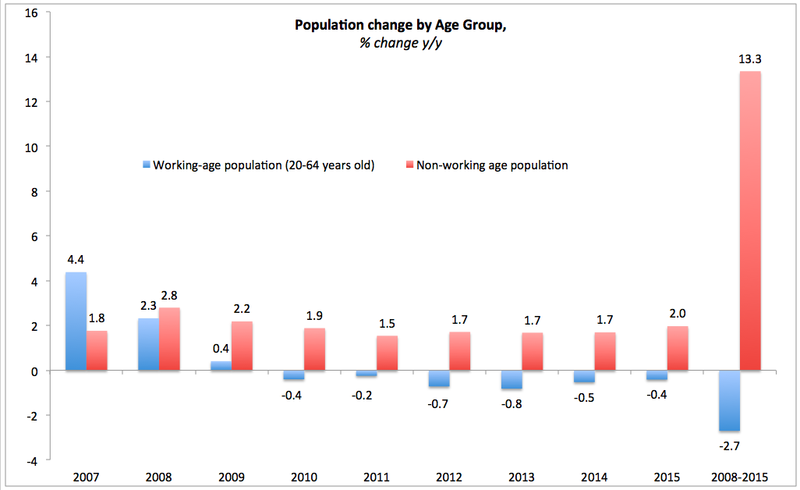 In other words, in 2015, there were 24 fewer working age adults per each 100 non-working age persons than in 2007.